Shortly after her creation in 1974, the Hello Kitty vinyl coin purse was introduced by Sanrio in March 1975. The character was then brought to the United States in 1976. The character is a staple of the kawaii segment of Japanese popular culture. By 2010, Sanrio had groomed Hello Kitty into a global marketing phenomenon, worth $6 billion a year. By 2014, when Hello Kitty was 40 years old, she was worth about $8 billion a year. As of 2019, Hello Kitty is the second highest-grossing franchise of all time, having generated $80 billion in lifetime retail sales. Originally aimed at preadolescent females, Hello Kitty's market has broadened to include adolescent and adult consumers, being found on a variety of products ranging from school supplies to fashion accessories. Several Hello Kitty TV series, targeted towards children, have been produced, as well as several manga comics and anime films. There have been two Sanrio theme parks based on Hello Kitty, Harmonyland and Sanrio Puroland. Yuko Shimizu, original designer of Hello Kitty. Sanrio decided to make Hello Kitty British because at the time when she was created, foreign countries, in particular Britain, were trendy in Japan. In addition, Sanrio already had a number of characters set in the US and it wanted Hello Kitty to be different. Shimizu got the name Kitty from Lewis Carroll's Through the Looking-Glass, where in a scene early in the book Alice plays with a cat she calls Kitty. Sanrio's motto is "social communication" and Tsuji wanted the brand name to reflect that. He first considered "Hi Kitty" before settling on "Hello" for the greeting. Spokespeople for Sanrio have said that Hello Kitty does not have a mouth because they want people to "project their feelings onto the character" and "be happy or sad together with Hello Kitty." Another explanation Sanrio has given for her lack of a mouth is that she "speaks from the heart. She's Sanrio's ambassador to the world and isn't bound to any particular language". Representatives for Sanrio have said they see Hello Kitty as a symbol of friendship, and they hope she will encourage friendship between people across the world. While there has been some speculation that Hello Kitty has its origins in Maneki Neko, and that the name Hello Kitty itself is a back-translation of Maneki Neko, which means beckoning cat in English, no definitive statement supports that speculation. Hello Kitty was originally marketed only towards a child and preteen audience. In the 1990s, the target market for Hello Kitty was broadened to include teens and adults as a retro brand. Marketed to those who could not get Hello Kitty merchandise as children, or who fondly remember items they had, Sanrio began selling Hello Kitty branded products such as purses and laptops. The 1994–1996 Face series was the first to be designed for a more mature appeal. Hello Kitty and Mimmy celebrated their 40th Anniversary on 1 November 2014. The "Arigato Everyone Birthday Celebration" took place in Sanrio Puroland in Tokyo for several days. Sanrio and various corporate partners have released Hello Kitty-branded products, including the Hello Kitty Stratocaster electric guitar (since 2006, with Fender in the US) and an Airbus A330-200 commercial passenger jet airliner, dubbed the Hello Kitty Jet (2005–2009, with EVA Airways in Taiwan). In late 2011 and early 2012, EVA Air revived their "Hello Kitty Jets" with their 3 new A330-300s. However, due to high demand, the airline added 2 more onto their existing A330-200s in mid-2012. A year after, EVA Air added another Hello Kitty Jet onto one of their 777-300ERs, which featured other Sanrio characters as well as Hello Kitty. In 2009 Hello Kitty entered the wine market with a collection of four wines available for purchase online, continuing an expansion of products targeted at older audiences. In Spring 2005, Simmons Jewelry Co. and Sanrio announced a partnership. "Kimora Lee Simmons for Hello Kitty" was launched exclusively at Neiman Marcus, with prices ranging from $300 to $5000. Designed by Kimora Lee Simmons and launched as the initial collection, the jewelry is all hand-made, consisting of diamonds, gemstones, semi-precious stones, 18K gold, sterling silver, enamel and ceramic. Hello Kitty cafés have opened around the world, including in Seoul and other locations in South Korea, Bangkok, Thailand, Adelaide, Australia, Irvine, California, and the Santa Anita Mall in California. In January 2018, Puma collaborated with Hello Kitty to create the new Puma X Hello Kitty For All Time collection, which features the company's signature sneakers for both children and adults. There have been several different Hello Kitty TV series. The first animated television series was Hello Kitty's Furry Tale Theater, an anime series that was 13 episodes long and aired in 1987. The next, an OVA titled Hello Kitty and Friends, came out in 1993 and was also 13 episodes long. Hello Kitty's Paradise came out in 1999 and was 16 episodes long. Hello Kitty's Stump Village came out in 2005 and The Adventures of Hello Kitty & Friends came out in 2006 and has aired 52 episodes. A crossover series with the development name Kiss Hello Kitty and pairing animated versions of the members of the rock band KISS with Hello Kitty was announced in March 2013, produced by Gene Simmons and planned to air on The Hub Network (now Discovery Family), but it never aired on any network. Hello Kitty's Paradise [ja] was a long-running live action children's program that aired on TXN from January 1999 to March 2011. It was the longest-running weekly kids television program in the network's history. In January 2011, the show's creators mutually agreed to end the series after twelve seasons, with the final episode being broadcast on 29 March 2011. In August 2018 Sanrio began streaming a CGI animated series on Youtube. It features Hello Kitty talking to the camera about her life in the style of vlogging virtual youtubers. Hello Kitty had two manga comics serialized in Ribon, a shōjo manga magazine. Hello Kitty Doki ran from May 2007 to April 2008, and Hello Kitty Peace was released in June 2008. Hello Kitty was mentioned in the parody song "Another Tattoo (parody of Nothin' On You by B.o.B and Bruno Mars)" from "Weird Al" Yankovic's 2011 album Alpocalypse. See also: Category:Hello Kitty video games. Hello Kitty Seasons (2010, Wii): A game in which the playable character is appointed as Deputy Mayor to help Sanrio Town. There were three Hello Kitty anime films released in Japan. Hello Kitty: Cinderella released in 1987, Hello Kitty no Oyayubi Hime released in 1990 and Hello Kitty no Mahō no Mori no Ohime-sama released in 1991. Hello Kitty's popularity in Japan peaked in the late 1990s, when she was the country's top-grossing character. In 2002, Hello Kitty lost her place as the top-grossing character in Japan in the Character Databank popularity chart. In a 2010 survey, she was in third place behind Anpanman and Pikachu from Pokémon. In 2010, The New York Times attributed the character's relative decline in Japan to her biography not being "compelling enough to draw many fans", wrote that analysts called the characterization "weak", and added that Hello Kitty not having a mouth has dampened her success as an animated TV character. Hello Kitty has nevertheless remained one of the top three highest-grossing characters in Japan as of 2013. Overseas, her global popularity has increased over the years, with worldwide annual sales reaching $8 billion in 2013. She has been particularly popular in other Asian countries for decades, such as in China, where her cultural impact is comparable to that of Barbie in the Western world. In 1994, artist Tom Sachs' was invited to create a scene for Barneys New York Christmas displays and titled it Hello Kitty Nativity; in it the Virgin Mary was replaced by Hello Kitty with an open Chanel bra, the three Kings were Bart Simpsons and the stable was marked by a McDonald's logo. This contemporary revision of the nativity scene received great attention (not all of it positive) and demonstrated Sachs' interest in the phenomena of consumerism, branding, and the cultural fetishization of products. In 2009, Tom Sachs' Bronze Collection was shown at the Public art space in Manhattan's Lever House, as well as in the Baldwin Gallery in Aspen, Colorado, and the Trocadéro in Paris. The collection featured large white bronze casts of a foamcore Hello Kitty sculpture – a style distinctive to the artist. As of April 2010, the Wind-Up Hello Kitty sculpture is still on display at Lever House. Although Sachs did not ask for permission to use the character in his work, a brand marketing manager for Sanrio was quoted as saying "You know, there was Marilyn Monroe and Andy Warhol, and then Michael Jackson and Jeff Koons. When you’re an icon, that’s what happens." In 2015, a 9 foot tall pearlescent Hello Kitty sculpture by artist Sebastian Masuda, was exhibited at the Dag Hammarskjold Plaza, New York City, as part of the Japan Society's exhibition: Life of Cats: Selections from the Hiraki Ukiyo-e Collection. ^ "Who is Soness? — Your Speaking Journey". Your Speaking Journey. Retrieved 30 March 2016. ^ a b "Hello Kitty". Sanrio. Archived from the original on 24 June 2011. Retrieved 22 December 2010. ^ サンリオキャラクターたちの本名、言えますか？ (in Japanese). 11 July 2008. Retrieved 11 July 2008. ^ "Hello Kitty | cartoon character". Encyclopedia Britannica. Retrieved 8 September 2018. ^ "Hello Kitty Hooks Generations On Cute, Kitsch". NPR. 3 December 2010. Retrieved 13 August 2012. ^ Miranda, Carolina A. "Hello Kitty is not a cat, plus more reveals before her L.A. tour". latimes.com. Retrieved 2018-03-06. ^ "Sanrio Announces Plans for Hello Kitty's Birthday Month". sanrio.com. Retrieved 22 March 2018. ^ a b Dhamija, Tina (1 April 2003). "Designing an Icon: Hello Kitty Transcends Generational and Cultural Limits". ToyDirectory. Archived from the original on 6 February 2009. Retrieved 28 December 2008. ^ a b "Hello Kitty celebrates 30". China News Daily. 19 August 2005. Retrieved 28 December 2008. ^ a b c d e f g h i Takagi, Jun (21 August 2008). "10 Questions for Yuko Yamaguchi". TIME. Retrieved 31 October 2009. ^ Tabuchi, Hiroko (14 May 2010). "In Search of Adorable, as Hello Kitty Gets Closer to Goodbye". The New York Times. Retrieved 6 October 2012. ^ "Hello Kitty making aliyah". Ynetnews. Yedioth Ahronoth. 18 February 2011. ^ a b Martinez, Michael; Hurtado, Jaqueline (2 November 2014). "Hello Kitty turns 40, draws 25,000 fans to convention". CNN. ^ "Hello Kitty Movie In The Works At New Line Cinema". Screen Rant. 5 March 2019. Retrieved 1 April 2019. ^ a b "Asia Times Online - The trusted news source for information on Japan". Atimes.com. Retrieved 2 October 2018. ^ "Sanrio Europe". Archived from the original on 1 October 2009. Retrieved 14 September 2009. ^ "Hello Kitty Turns 35". Time. 1 June 2009. Retrieved 14 March 2012. ^ a b c d e f g Walker, Esther (21 May 2008). "Top cat: how 'Hello Kitty' conquered the world". London: The Independent. Retrieved 19 September 2008. ^ "Hello Kitty, You're 30". St. Petersburg Times. 15 November 2004. Retrieved 22 March 2012. ^ a b Tracey, David (29 May 1999). "The Small White Cat That Conquered Japan". New York Times. ^ Walker, Rob. Buying In: The Secret Dialogue Between What We Buy and Who We Are. Random House, Inc., 2008. 18. Retrieved from Google Books on 30 August 2010. ISBN 1-4000-6391-4, ISBN 978-1-4000-6391-8. ^ Nielson, Paula. "Japanese Hello Kitty Derived from Maneki Neko". Archived from the original on 12 February 2015. Retrieved 30 August 2014. ^ "Maneki Neko The Beckoning Cat and Nang Kwak". Lucky Mojo Curio Company. Retrieved 30 August 2014. ^ Yano, Christine (29 April 2013). Pink Globalization: Hello Kitty’s Trek Across the Pacific. Duke University Press. p. 127. ISBN 978-0822353638. Retrieved 30 August 2014. ^ a b c d e f g Tabuchi, Hiroko (14 May 2010). "In Search of Adorable, as Hello Kitty Gets Closer to Goodbye". NYTimes.com. ^ Paschal (18 May 2003). "Sanrio's Hula Kitty heads to the beach". Honolulu Star-Bulletin. Retrieved 30 April 2015. ^ "World's first 'Hello Kitty' airplane to make debut Lunar New Year flights". The Taipei Times. 13 December 2005. ^ Garcia, Catherine (26 March 2010). "Please pass the bubbly, Hello Kitty". Entertainment Weekly. Entertainment Weekly. Retrieved 2 November 2015. ^ "Kimora Lee Simmons for Hello Kitty". Archived from the original on 24 August 2011. Retrieved 4 May 2011. ^ "Hello Kitty Fine Jewelry". Archived from the original on 12 May 2011. Retrieved 4 May 2011. ^ Catherine Shu (27 March 2009). "RESTAURANTS : Hello Kitty Sweets". Retrieved 17 October 2009. ^ "Hello Kitty Sweets resto in Taipei (Part I)". 30 April 2008. Retrieved 28 December 2008. ^ "Here Kitty Kitty...Hello Kitty Diner Comes To Sydney". Notquitenigella.com. Retrieved 2 October 2018. ^ "Hello Kitty Now Has Her Own Dim Sum Restaurant in Hong Kong". Time. Retrieved 2018-03-09. ^ "Hello Kitty opens First Cafe in Australia and it's a Sweet Tooth Paradise with Plenty of Selfie Opportunities with Plastic Cats". 3 December 2014. Retrieved 8 April 2017. ^ LUNA, NANCY. "First Hello Kitty 'pop-up' cafe opens in Irvine". The Orange County Register. Retrieved 2017-03-29. ^ Eidell, Lynsey. "Sorry, Starbucks: There's Now a PERMANENT Hello Kitty Café". Teenvogue.com. Retrieved 2 October 2018. ^ "Hello baby! Hello Kitty welcomes Taiwan newborns". Reuters.com. 5 December 2008. Retrieved 9 December 2008. ^ "Taiwan hospital a hit with Hello Kitty fans". The Sydney Morning Herald. 21 January 2009. Retrieved 6 March 2009. ^ Schuldt, Brooke (31 January 2018). "Puma Is Collaborating With Hello Kitty to Launch the Cutest Sneakers Ever". Travel+Leisure. Retrieved 4 February 2019. ^ Lockner, Melissa (29 March 2013). "Hello Kitty and KISS to Team Up For New Animated Series". TIME. Retrieved 18 January 2015. ^ Chapman, Paul (30 August 2018). "Hello Kitty Makes Her Virtual Youtuber Debut". Crunchyroll.com. ^ Lee, Dami (30 August 2018). "Hello Kitty has no mouth, and she must vlog". The Verge. ^ Sims, Chris (16 March 2016). "New Online Manga Sees Hello Kitty Fighting Monsters With Her Giant Robot". Comics Alliance. Archived from the original on 18 March 2016. ^ "Hello Kitty's Superhero Alter Ego Ichigoman Gets Web Manga". Anime News Network. 15 March 2016. ^ "Lakeshore Records". Lakeshore Records. ^ "VOCALOID2 猫村いろは" [Vocaloid 2 Nekomura Iroha] (in Japanese). AH Software. Retrieved 16 September 2010. ^ Fujimoto, Ken (16 August 2010). "ハローキティといっしょ!×VOCALOID2って何だ!?" [Hello Kitty Together with Vocaloid 2; What the!?] (in Japanese). Livedoor. Archived from the original on 20 August 2010. Retrieved 20 August 2010. ^ Parker, Lyndsey (1 November 2014). "Yoshiki Debuts Official Hello Kitty Theme Song at Hello Kitty Con". Yahoo!. Retrieved 30 January 2016. ^ "Hello Kitty's Big Fun Piano". MobyGames. Retrieved 28 December 2008. ^ "Hello Kitty: Big City Dreams". IGN. Retrieved 28 December 2008. ^ "Hello Kitty Parachute Paradise". ZIO Interactive. Archived from the original on 5 August 2009. ^ Latshaw, Tim (30 March 2014). "Review: Hello Kitty Kruisers". Nintendo Life. Retrieved 7 July 2017. ^ Jaafar, Ali (3 July 2015). "'Hello Kitty' To Be Turned Into Film For 2019 Release". Deadline. Nikkei. Retrieved 5 July 2015. ^ Barsanti, Sam (5 March 2019). "An American Hello Kitty movie is in the works". The A.V. Club. Retrieved 5 March 2019. ^ "Japan's Hello Kitty resolves bunny battle with Miffy". news.yahoo.com. 8 June 2011. Retrieved 4 March 2017. ^ "Miffy cracks down on copyright infringements | Radio Netherlands Worldwide". Rnw.nl. 7 September 2011. Archived from the original on 17 October 2012. Retrieved 13 August 2012. ^ "Le Matin, l'actualité en direct: sports, people, politique, économie, multimédia". Lematin.ch. 19 July 2012. Retrieved 13 August 2012. ^ "Hello Kitty named Japan tourism ambassador". MSNBC. 19 May 2008. Retrieved 1 October 2008. ^ "UNICEF Special Friend of Children". Sanriotown.com. 23 March 2007. Retrieved 1 October 2008. ^ "Tienda Hello Kitty". The Japan Times Online. 10 June 2004. Retrieved 1 October 2008. ^ Prange, Christiane (2016). Market Entry in China: Case Studies on Strategy, Marketing, and Branding. Springer. p. 155. ISBN 9783319291390. ^ Bruce Weber (13 December 1994). "Barneys Halts Store Display Of Pop Creche in Window". The New York Times. Retrieved 22 April 2010. ^ Mlynar, Phillip (29 April 2015). "A Giant Hello Kitty Sculpture Just Popped Up In New York City - Catster". Catster.com. Retrieved 2 October 2018. 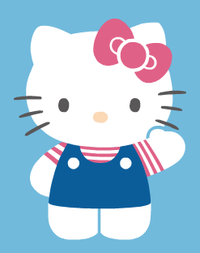 Wikimedia Commons has media related to Hello Kitty. Hello Kitty at Don Markstein's Toonopedia. Archived from the original on 8 January 2016. This page was last edited on 2 April 2019, at 19:35 (UTC).